Kyle and I sat at dinner out, away from children, and I still couldn't relax and enjoy myself. I was distracted, and had been consistently for weeks. Slumped at the table, I stared at him and tried to explain how I was feeling. Me: I feel overrun with thoughts and emotions, many of them sad and discontented and that I can't figure out. My brain feels like it's being pulled in a million different directions. What is going on with me? Kyle, after listening to my winding trail of thoughts for many minutes: You check email a lot. You're on your phone a lot. My purse sat on the booth seat beside me where inside my phone's blinking green light beckoned even as he said those words. He's right, I thought. I immediately recalled a conversation I'd had with a group of women about our children and technology. What was it one of them had said? When people are on their phones, they're not present in their lives. They're going someplace else. Well, that just sort of explained it all--the discontentedness, the obsessive comparison with other women, the uncertainty and its resulting pursuit of online evidence that I'm successful and/or loved, the desire for what I don't have and wonder if I'll ever have, the pride. I'd only been checking my phone in every down moment, but it seemed apparent such simple, seemingly inconsequential acts of swiping and scrolling were not simple and inconsequential after all. ugh. The next morning, I opened my Bible, opened my issues to the Lord, and waited. I knew He was going to talk to me about it, and He did. Me: God, help me. I've allowed technology to distract me beyond measure. I'm causing myself great pain. God: Doesn't this remind you of something you just read recently, something about piercing yourself through with many sorrows? What does it say? This is what I'd just read in 1 Timothy 6:9-10: But those who desire to be rich fall into temptation and a snare, and into many foolish and harmful lusts which drown men in destruction and perdition. For the love of money is a root of all kinds of evil, for which some have strayed from the faith in their greediness, and pierced themselves through with many sorrows. God: What you're doing is being greedy. 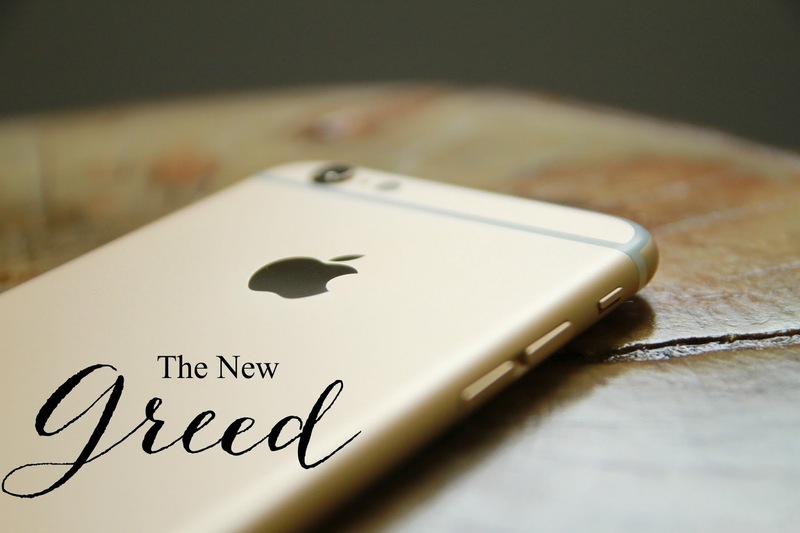 Technology and social media is birthing a new greed, and you've fallen into the snare. Your desire for accolades, invitations, relationships with those I haven't given you, followers, and whatever contentment you think this will give as you pursue it is covetousness and greed, and all you're accomplishing is a piercing of yourself through with many sorrows. 1 Timothy 6:17-19: Command those who are rich in this present age not to be haughty, nor to trust in uncertain riches but in the living God, who gives us richly all things to enjoy. Let them do good, that they be rich in good works, ready to give, willing to share, storing up for themselves a good foundation for the time to come, that they may lay hold on eternal life. God: Your greediness means you're trusting in uncertain riches and not in Me. It also slices your mind in a million pieces, taking you out of your present life that I've given you richly to enjoy, and causing stress. This stress gives the illusion that you don't have time to give to others, that you're busy in ways that you're not, that you don't have enough when you have all you need, and that you must be stingy with yourself. Going somewhere else in your mind takes away time and energy that could be given to the good works right in front of you. You are rich--in love, in time, in energy, in gifts--but you act as if you're not. 1 Timothy 6:11-12, 6: But you, O man of God, flee these things and pursue righteousness, godliness, faith, love, patience, gentleness. Fight the good fight of faith. God: This is what matters. This is true gain, not an uptick in Twitter followers or an important email coming through or seeing how you stack up against others. And all of what's important in regards to contentment happens in the present. Pursue godliness and pursue contentment in Me. This is great gain. Me: You're absolutely right. I feel so silly that I step so willingly into the snare of greed. God: What does it say? Fight the good fight of faith. This isn't silly; it's a fight. The new greed. That phrase keeps ringing in my ear as I'm seeking God about how to fight the good fight of faith. The new greed. We are after so many things, and it's playing out on our phones and iPads and computers as much as it ever has in our material possessions and our bank accounts. Why are we--why am I--checking my phone so often, scrolling through Facebook or Instagram? What exactly are we looking for? Why are we leaving our present reality that God has given us so richly to enjoy to go somewhere else in our mind, a place often called Comparison or Discontent? It's something to think about, because it muddies the waters of what has real value, and because greed's mantra is that we never have enough. Me: I am currently in the present reality which God has given me richly to enjoy. I have enough and will not be ensnared by subtle greed and covetousness.